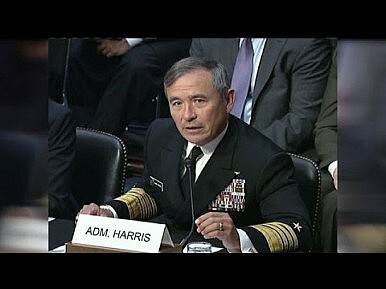 Image Credit: YouTube screen capture of Admiral Harry Harris. Over the past week, the apparent conflict between PACOM and the Obama administration has generated a pool of digital ink big enough to build a Chinese island in. The apparent disinterest of the Obama administration in entertaining the more aggressive navigation and flight operations proposed by PACOM commander Admiral Harry B. Harris has produced a great deal of criticism, even as both sides sought to quiet the conflict. It’s worthwhile at this point to stop and think through the practical limits on what the United States can do. The dirty little secret of politics in the South China Sea is that the United States can really do very little to prevent China from building islands. The USN can demonstrate its contempt for Chinese construction by sailing near the islands; the USAF can fly over them. But unless American ships and planes directly fire upon Chinese forces, the latter can continue construction after the U.S. passes by. As long as it remains unwilling to fire guns and missiles at Chinese ships, or to facilitate the illegal construction of China’s regional competitors, the United States can only express its displeasure, albeit at a variety of volumes and frequencies. Does This Mean Giving Up on the Pivot to Asia? No. Any strategic shift as large as the Pacific Pivot contains numerous smaller-scale options, means of modulating tension and pressure in order to secure long range goals. Indeed, any strategic approach must have a degree of flexibility in order to manage unexpected actions and events. There is no evidence whatsoever that the Obama administration has abandoned the idea that the rise of China represents the central strategic problem faced by the United States, or that tempered regional engagement is the best way to meet this problem. What About the Message Sent to U.S. Allies? The road to hell is paved with efforts to reassure sketchy clients. Most of the claimants to the South China Sea fear Chinese power and aggression, and have become interested in preventing China from making more aggressive claims to the South China Sea, or at least protesting those claims. U.S. freedom of navigation operations play well in this context. But all of the claimants also enjoy strong, robust commercial relationships with China. None benefit from an increase in tension, or from a confrontation caused by a miscalculation. The U.S. Navy is left in a position where it seems it must embrace a more aggressive posture than any potential ally is willing to embrace, simply in order to reassure potential allies. Moreover, there is precious little to indicate that these allies are attentive to or impressed by the details of U.S. freedom of navigation operations as the U.S. Navy seems to believe. Here’s what the United States can do: use Chinese aggression to leverage the development of multilateral partnerships and institutions that include and privilege the United States. And this, in fact, is what the United States is doing, and what it continues to do. Lost in the headlines about the deployment of the latest patrol aircraft to a man-made island, or the latest set of sandbags to a previously uninhabitable rock, has been the long-term, fruitful efforts to establish the United States as the hub of a multilateral system of maritime maintenance and Chinese containment in the South China Sea. Whether or not the U.S. Navy conducts a patrol or an “innocent passage,” and whether President Obama solicits the advice of PACOM on operational minutiae, is quite frankly trivial in comparison to this larger project. The core of U.S. strategy in the South China Sea, and more broadly in East Asia, is to ensure that China continues to have few allies, and that those few allies are of poor quality. Disputes over the ownership of man-made rocks are secondary to this broader goal, a fact which Beijing seems not to understand.